Winx tingled our spines and gave us one of those “where were you when...” moments at Randwick on Saturday. Where were you when the mighty mare raced for the last time – and won. It was the race that stopped the nation. Stopped a lot of people in a lot of places around the world as well. The $4 million Group One Longines Queen Elizabeth Stakes over 2000m was meant to be a celebration of the greatest horse of our time – maybe the best ever – and we weren’t disappointed. This day wasn’t about Winx’s incredible statistics, although she improved them even further to finish with 37 wins from 43 starts, including the last 33 in a row, 25 Group Ones and in excess of $26 million in prizemoney. This was about saying goodbye and the sell-out crowd of over 40,000 paid the ultimate tribute to the seven-year-old wonder horse. They packed the race-day stalls just to get a glimpse of Winx standing there after she had arrived at the track. They cheered enthusiastically when he was led into the Theatre of the Horse pre-race. Then they took it up a notch when she stepped on to the track for the last time ever. But anything can happen in a race and until all of the variables are safely negotiated there is always the risk of something going wrong. So when Winx strode to the lead in the straight it was time not just for her – but everyone at Randwick - to let down. The crowd roared with approval as she raced clear to win by one-and-a-half lengths over Kluger, with Hartnell two-and-a-half lengths away third, and they wildly welcomed her when jockey Hugh Bowman brought her back to scale. Race won. Career over. Now the legend begins. The Queen Elizabeth hadn’t been kind to champions trying to go out as winners in this race. Gunsynd, Octagonal and Lonhro had all been beaten. But this was Winx. Nothing else had been able to stop her for such a long time, so how was a supposed hoodoo going to do it? No chance. Winx began from the outside barrier in the nine-horse field and settled back in sixth on the outside as roughie Mask Of Time took up the lead. She cruised up around the outside turning for home and then Bowman clicked her through the gears as she went out the right way – with yet another victory in a big race. It was her third straight win in the Queen Elizabeth. Tina Turner’s Simply The Best boomed over the course amplifiers, blue streamers were shot into the air from the old members’ grandstand and there were plenty of tears to go along with the cheers. Part-owner Peter Tighe broke down as he told what the horse meant to him and trainer Chris Waller was very emotional as well. Stunningly, it was Waller’s 100th Group One win as a trainer. He had reached 99 when Verry Elleegant won the previous race, the Heineken 3 Australian Oaks, and not for him the nervous 90s. The century was reached at the first available opportunity. Waller then made it 101 when he trained Shraaoh to win the Schweppes Sydney Cup. Three straight races – three straight Group Ones. It ranks as an enormous achievement on its own and would be a huge story in itself on a normal day. But like everything else that happens on a day like this it gets dwarfed by the Winx juggernaut. Waller conceded there was enormous pressure involved in training a horse that is a public idol like Winx, but he still wouldn’t have it any other way. “It has been amazing to be a part of it,” he said after she won, his voice shaking. “I’m a small cog in the wheel. Bowman marvelled at what Winx could still do as a seven-year-old. 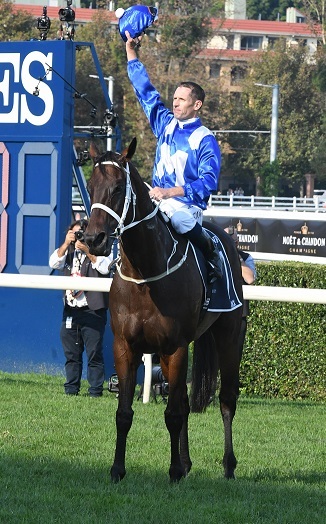 Part-owner Debbie Kepitis described Winx as “the most amazing supreme athlete” and Waller as “the best coach”. No-one will argue with those sentiments. So, four years and two days after she last lost a race – the Australian Oaks, when she ran second to Gust Of Wind – Winx departed a winner. Was it ever going to be any other way?